This is a topic almost as old as this blog. 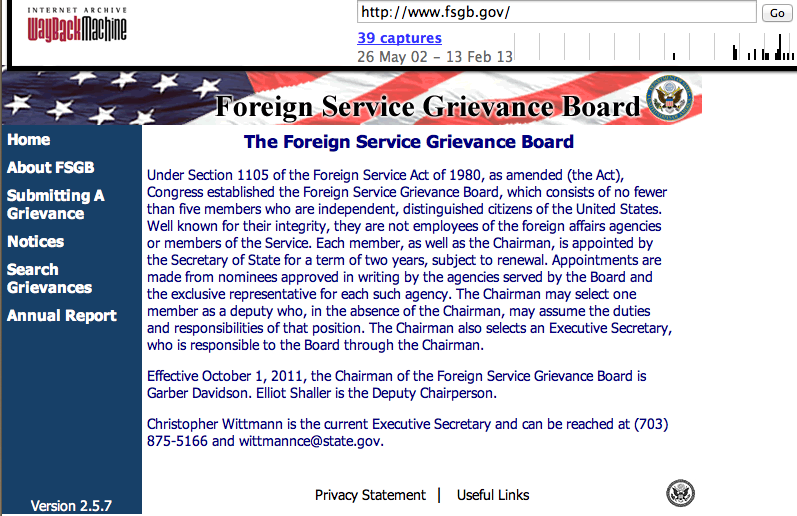 In 2008, we wrote that the Foreign Service Grievance Board website was like a relic from an Internet cold war. All the documents were still posted in MS Word, the search function was not terribly helpful and there was no option to search/browse its pending or resolved cases. About 48 hours later when we look again, we found this! “Browse Grievances” is now available by year. By far, 1996 was a banner year for grievances with 175 cases listed. The posted cases from 2012 are available mostly in pdf files, making it accessible to read even without MS Word installed. New decisions issued by the FSGB now include the names/signatures of the panel members hearing the cases. Previous cases did not always have the names of the FSGB members or their signatures. The contact page includes two email addresses and the Executive Secretary’s telephone number. Have yet to test if either or both respond to inquiries. The one thing that still needs attention on the FSGB website is the “Search Grievance” function which does not appear to work as well as it should. You can search by year and by specific Record of Proceeding (ROP) and it will return the appropriate records. But if you do the “Document Search” field for instance, on records pertaining to “EER,” “discipline,” “financial,” or “separation” — the top cases filed within the Board, the new website returns a “no match” result. We’ve used “OR”, “AND”, double quotes, and a wildcard “*” with the same “no match” results. We suspect that providing a better end-user search experience was among the top justifications for migrating the old website to this new Sharepoint site. But the FSGB cases do not use meaningful file names and titles, so while browsing the cases is available, it does not make locating the files any more easier or quicker. It also does not look like the cases have been tagged or use metadata; both if used would help tremendously in improving the “findability” of the cases in the new website.